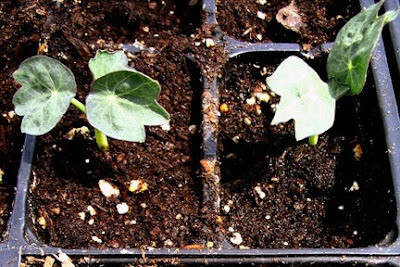 Or, said in a more boring and yet decidedly clearer way: Winter Seed Sowing Update! My winter-sown babies spent their first uncovered evening last night! Because anything that has dared to sprout already is pretty hardy, I wasn't really worried about temperatures suddenly dropping to below freezing despite the predicted low of 45. OK, I lied. I was in fact the tiniest bit overly protective of a few nasturtiums, which I lost last year to an unfortunate and rare combination of too many extremely warm days followed by too many extremely cold nights, and which I'm growing for the heirloom garden at Cobblestone Farm. 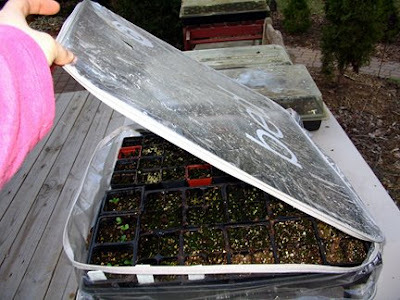 But as I'll be going away for a day soon, and can't leave the sprouts covered (with predicted sunny skies and highs near 70, it could get way too hot inside the little greenhouses), the seedlings had to get used to being uncovered day and night. And everyone did fine, even the nasturtium! A cool thing about nasturtium seed leaves is that they look just like their true leaves, which is fairly rare (see photo of lupines below). 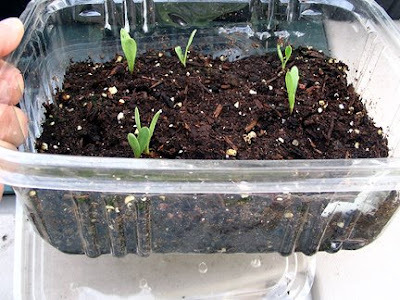 Do keep the lids handy, however, because you never know when Mother Nature will sneak in a freezing evening or send hail in June. 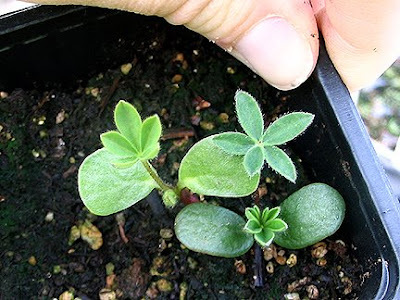 However, my cutest seedlings by far are lupines, the seeds of which my friend Carole bought for me in Nova Scotia. They just got their first set of true leaves and are just the cutest little things ever! Noogie! Noog noog!